Our last guide trip for the year was on November 4th. We had the good fortune of guiding a very private section of a small creek north of Bozeman that is loaded with hungry trout, so it was fun to say the least. When the fishing season starts to wind down, first it’s a sense of relief as we’ve been busy non-stop for months. But as a little time goes by we’re able to reflect on the past season and almost immediately we’re chomping at the bit to get back on the water. This 2015 guide season started off with a bang and proved to be one of the best years we have ever experienced. An unseasonably warm winter had us on the water for our first trips of the season in mid-March on the jet boat at the Land of the Giants. As always this produces some of the best rainbow trout fishing in the world. We bounced around the Missouri and the Madison for March and April chasing fish on streamers and nymphs experiencing world class fishing almost every day on the water. When the fishing is this good for this long you start to wonder when your luck is going to run out. Turns out we were just getting started. This year our major hatches started during the first week of May when our timing worked out perfectly and we hit the sqwalla hatch on the Jefferson River. The Jeff is not necessarily known for its dry fly fishing and we were not necessarily there to fish dries but, the stars lined up and the fish looked up. At times it was overwhelming how many of these medium sized stoneflies were on and around us. We caught a lot of rainbows and some really nice browns. Next it was back to the Yellowstone. It’s pretty amazing when all of the stars line up for the famed “Mothers Day caddis hatch” and this was the second year in a row where exactly that happened. The low snow pack had the water clarity perfect when the temperature hit its magic mark and the bugs poured off of the river by the millions. With low winds we were on the water from daylight to dark experiencing the very best quintessential dry fly fishing there is. Browns, rainbows, cutthroats, cutbows and even the whities all had their noses out of the water gorging themselves on adult caddis. It is interesting that with thousands of bugs on the water the trout almost always pick out your fly and crush it when the hatch is on! The caddis hatch came and went and we geared up for the Holy Grail, the salmon fly hatch. Generally the Yellowstone is too high and muddy to fish the salmon fly hatch and we are usually on the upper Madison or the Big Hole chasing big bugs. This year was different. The low snow levels and early run off had the river a perfect “green is good” color about two weeks early this year. Before the actual hatch we were fishing stonefly nymphs with amazing success and netting some remarkable fish. Then it happened… It seemed as though if you hit the hatch right, on the section of river that you were floating, that every salmon fly in the river was hatching. They swarmed by the thousands, you could hear them all around you and at times the sun was actually dimmer from their presence. It was an incredibly predictable hatch; it started down low and would be strong for two days and then move up stream and repeat. We followed if for days and called as many fishermen as we could to come experience it with us. The fish gorged themselves day after day on big bugs and never seemed to let up. This was truly an amazing hatch like nothing that I had ever seen before. The few lucky folks who were here had the experience of a lifetime. After weeks of chasing big bugs they finally died off and it was once again time to switch gears. Late July and August came quickly. 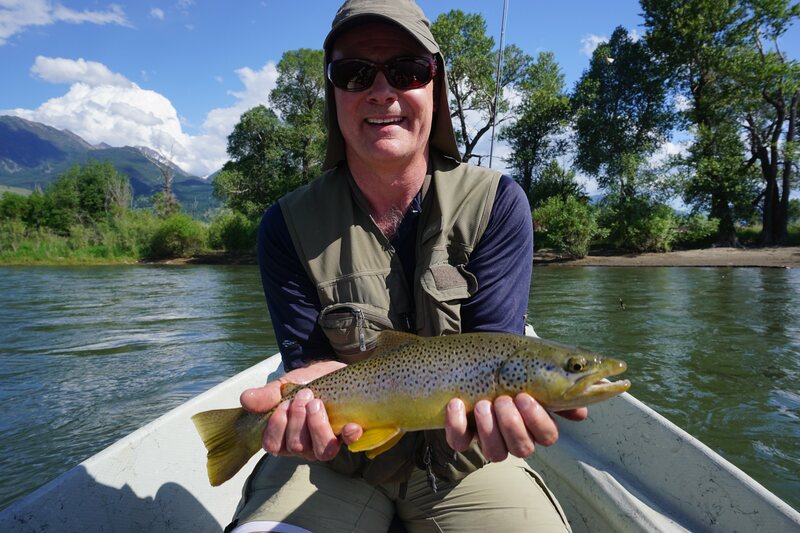 It seemed as though the Yellowstone blew out weekly from afternoon thunderstorms, which was a great way to give the river and the fish a rest. On days when the river was just starting to clear we were able to target the bigger browns with dead drifted sculpins and streamers. 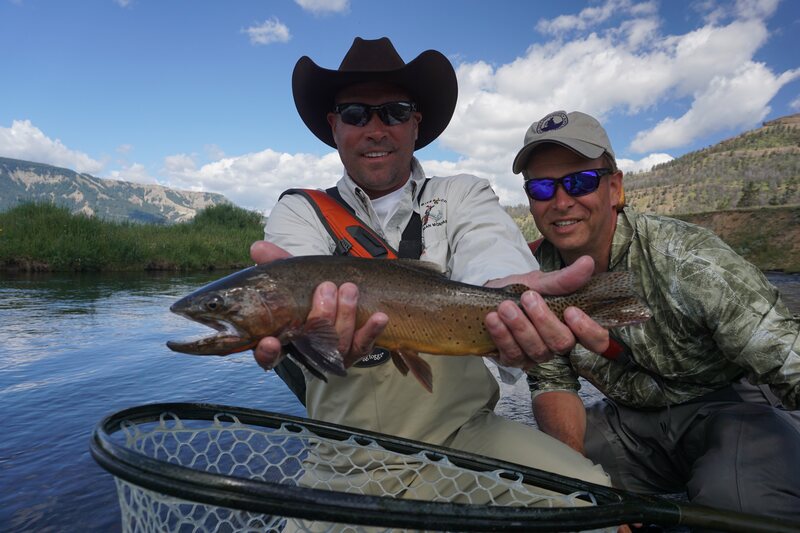 On days when the river was dirty we headed into Yellowstone Park and threw dries at eager cutthroats for some amazing dry fly fishing. Including a week long drake hatch that was absolutely amazing. It was a joke you could throw anything on the water and the fish ate it. When the river was clear, as it was most days, life was good. Sunny temperate days kept the water temps bellow 70 for the most part and we enjoyed typical summer conditions; fishing dry-dropper rigs typically consisting of a hopper with a stone fly dropper. 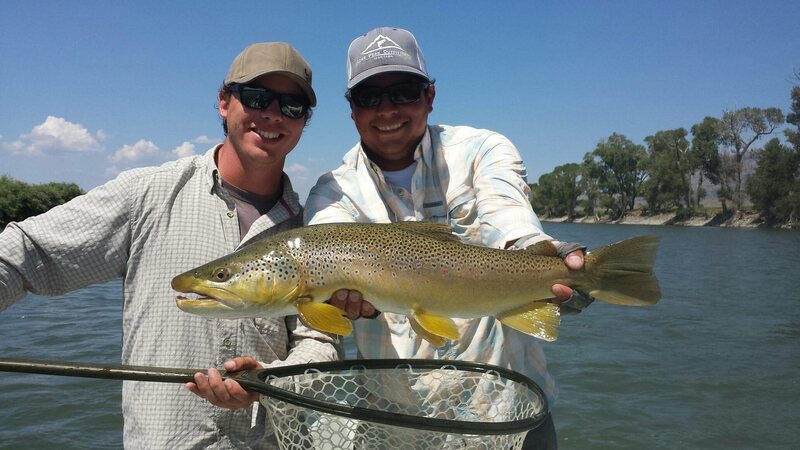 The end of August brought awesome hopper fishing on the rivers but especially in the park. 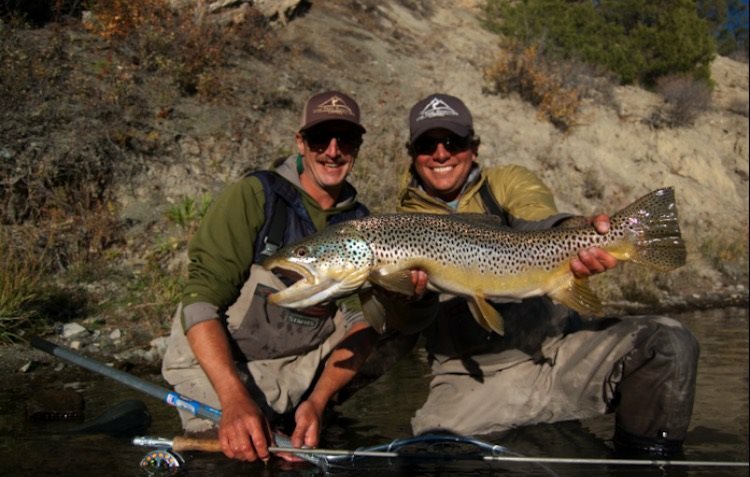 The upper stretches of the Lamar drainage holds arguably the best terrestrial fishing for wild trout in the world. We spent many days hiking to smaller rivers and casting flies under cut banks for big, hungry cutthroats in the park this summer and had a blast catching them on big pink hoppers and ants. This year the season parted ways with an Indian summer and we experienced warm weather right up until the end of September leading perfectly into my favorite season… October. October actually started off a little slow. We fish lake tributaries in October and the warmer temps in September kept the water temps higher and the big fish did not start their spawning migration until about the middle of the second week of October, once they did it was on. Both the nymphing and streamer fishing produced some truly amazing browns this fall on the Madison, Jefferson and Missouri. We spent every day of the month targeting these big, pre-spawn fish, caught a lot of nice ones along the way and every once in a while got lucky and stuck a giant. All and all it was a great year. We caught a lot of great fish and fished with a lot of awesome people both those that we have fished with in the past and new friends made this year. The weather was incredible and as always Montana provided some amazing experiences. Now that the season is over I can’t wait for it to start again. For now we will have to stick with bird hunting and traveling to chase saltwater fish in warmer places.